Would Christians And Conservatives Be In Gulags By Now Had Hillary Clinton Won The Election? Although President Trump caused a near mainstream media meltdown with the announcement of the winners of 2017's 'fake news awards' resulted in CNN, ABC, the NY Times, the Washington Post, Newsweek and Time taking home well-deserved awards for lying to the American people, it's time to take a look at the bullet America dodged with the election of President Trump into office. As we learn in a new story from Newsweek, even though Hillary sits at home, their bizarre story claims Hillary could still become president as reported in more detail below. We also take another look at the ongoing war upon independent media that's just claimed another victim. While Arizona's Republican Senator Jeff Flake recently embarrassed himself in Congress by giving a speech comparing President Trump to Soviet dictator Joseph Stalin, a speech that only 2 other senators attended, both Democrats, it's quite easy to see the direction that America would have taken had Hillary won just by looking at what is happening now in Europe and Canada where the freedom to speak as one chooses has already fallen. With recent moves by French President Emmanuel Macron to ban the spread of 'fake news' being akin to one of the greatest tools of dictators, WHO gets to decide if news is 'fake', the dictator slaughtering his people? Evidence shows should Hillary Clinton had won in November of 2016, it's likely that many of us would now be sitting in her Soviet-style gulags called 'FEMA camps'. And while we've thought that we were finally done with Hillary Clinton, Newsweek reports today that Hillary could still be president if the Russia probe finds 'conspiracy evidence'. More fake news from Newsweek? And would such an abolute nightmare lead to civil war in America? While a huge long shot, Hillary and the globalists never have played by the rules. From the Newsweek story. Nearly a year after President Donald Trump’s inauguration, a Harvard University professor says 2016 presidential candidate Hillary Clinton could still become commander in chief. Lawrence Lessig, the Roy L. Furman professor of law and leadership at Harvard Law School, penned an essay for Medium in October outlining a series of hypothetical scenarios that could take place should the ongoing probe find that the Trump campaign actually conspired with Russia to influence the results of the election. On Wednesday, Lessig told Newsweek this scenario was still a possibility. We should all remember that prior to the election of President Trump, Hillary Clinton's own deputy communications director Christina Reynolds stated the following in a fundraising email that leads us to ask, who are the real anti-free-speech fascists? The fundraising email asserted that right-wing site Breitbart News has no “right to exist,” and heavily suggested that as president, Clinton will make sure it is shut down entirely. In context, her statement is intended to say that Breitbart does not have the same right. 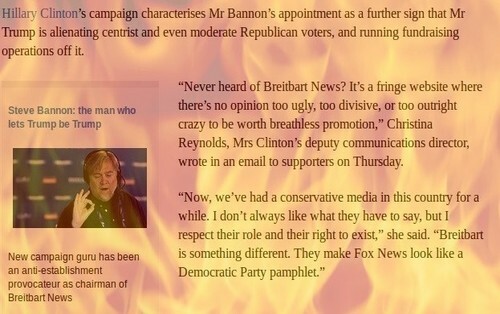 To ensure there was no mistaking the meaning behind the email, Reynolds reportedly stated that one of the goals of the Clinton administration will be to ensure that Breitbart is destroyed. 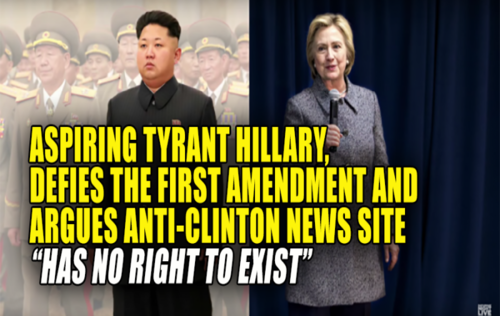 As Infowars also reported back on August 21st of 2016, then 'Presidential hopeful' Hillary Clinton’s campaign suggested in a recent fundraising email that the website Breitbart News has no “right to exist” and that Clinton would shut it down if elected, putting all alternative news in danger. And while fortunately, Hillary lost, we're still witnessing her war upon the truth and those who tell it as the 'tech giants' who sold their souls to get her elected have just taken down another conservative website as reported in this new Gateway Pundit story. As we reported on ANP back on January 3rd, a massive 'red flag' had gone up with the closure of independent news' 'Red Flag News'. Well, as the Gateway Pundit story reports, the latest victim to fall is the conservative website Right Wing News, a website which had been online since 2001, a 17-year run come to an end. With the all-out war we're also now witnessing upon Christians and conservative thought by 'big tech' including Google, Facebook, Twitter and YouTube, a perfect example of big tech enabling dictators comes to us from a recent Project Veritas expose as seen in the 2nd video below in which they capture a former Twitter software engineer admitting that the social media giant silences users at the request of foreign government's, most notably China as reported in this new Infowars story. Why has big tech taken upon the role of enabling dictators? The exchange below between the Project Veritas journalist and the former twitter engineer should be a warning call to the world. And while globalists and many on the left continue to compare President Trump to Adolf Hitler, should we be surprised that many of those same people are seemingly backing Kim Jong Un and North Korea against President Trump and America? While Reporters Without Borders recently reported that President Trump was a major threat to 'US Democracy', the fact that the US had already fallen to the ranking of #41 for press freedom while Barack Obama was in office proves that the descent of America in getting truth to the masses dropped long before President Trump got into office. Why are countries such as Germany, Slovakia, Surinam, the Czech Republic, Ghana and Latvia ranked AHEAD of the US in press freedom? Any ranking at all less than #1 shows we have long been moving towards tyranny and with the mainstream media now being outed as completely in the globalists/Hillary Clinton camp, is there any wonder that the US was so poorly ranked? As we've previously reported on ANP, much of the censorship that we're witnessing now from not only big tech but nation states can be tied directly to the criticism of Islam. As the Gatestone Institute reported back in March of 2017, Germany's 'jihad on the freedom of speech' has followed a pattern in Europe with German police so busy raiding homes across the country and targeting citizens who write "hateful" or "offensive" Facebook postings that they don't have to capture the Islamic terrorists who are slaughtering people. And meanwhile, mosques in Germany are openly preaching anti-Semitism and ISIS-style jihadism. Why are Europe and 'big tech' fighting against so-called 'hatred' and 'racism' while allowing terrorists free reign? As this January 13th story from Activist Post reports, the so-called 'fight against fake news' is really just a back-door trick to enact censorship and as we've previously reported on ANP, with the independent news media largely backing President Donald Trump while the MSM ran nearly 90% of their stories against him, the globalists would love to take down the independent, pro-Trump media prior to the 2020 election. 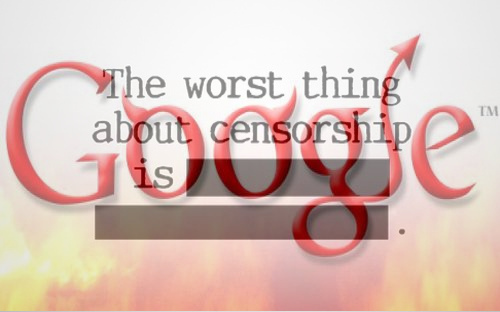 As the Toledo Blade reported back in October 2017, tech giants such as Google, Facebook and Twitter should not be trusted with protecting free expression with news coming out since the election proving they play partisan politics and damn the truth. While not a fan of Ted Cruz as a presidential candidate against President Trump, he's a bulldog in Congress and as we see in the final video below, he rips the tech giants over their clear and obvious censorship of Conservatives. As we hear in the first video below from Reason TV, so-called 'fake news' is not a reason to regulate the internet, nor is truth a reason for the crackdown on the freedom of speech we're now witnessing across Europe and Canada. In closing, just imagine the 'Russia probe' finding (fake) evidence of Trump collusion with Russia that allows them to run this administration out of office while bringing Hillary in as the Newsweek story dreams. The stuff of nightmares? With Hillary the sole arbiter of what is real news and what is fake news, 'the truth' would forever be unknown and history soon thereafter long forgotten.